Panel highlights strategies for making health care systems “suicide safe." As part of national efforts to align public and private suicide prevention initiatives, EDC’s Jerry Reed recently moderated a panel on suicide prevention and care. The discussion was part of the White House’s Making Health Care Better series, which examines the country’s most persistent health care issues. Mental health experts, staff of nonprofit organizations, and leaders of federal health agencies came together to discuss supporting those at risk for suicide and their families. In introductory comments, Reed spoke about the role that health care systems can play in caring for and treating people at risk for suicide. He singled out EDC’s Zero Suicide initiative, a comprehensive plan to reduce instances of suicide in health and behavioral health care systems, as being a transformative model for suicide prevention. The panel discussion was part of an event examining the current state of suicide prevention initiatives. It also included the first-ever panel at the White House composed entirely of individuals with lived expertise—those who have made an attempt, or lost a loved one to suicide, and are using their experiences to inform future prevention efforts. EDC’s Colleen Carr, manager of policy and strategic partnerships for the National Action Alliance for Suicide Prevention, a public-private partnership championing suicide prevention as a national priority, said that the event reflected how far the field of suicide prevention has come. During the panel discussion, Keita Franklin, director for the Defense Suicide Prevention Office at the Department of Defense, announced that the Air Force has adopted the Zero Suicide approach on five installations across the United States. Mary Smith, director of Indian Health Services (IHS), also announced that IHS will soon embed a Zero Suicide approach to care within their health system. 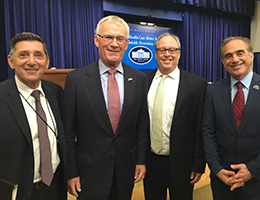 Photo: (l-r) Director Michael Botticelli, Office of the White House Office of Drug Control Policy; Robert Turner, Action Alliance private sector chair; Jerry Reed, EDC vice president and director of CSPIVS; and David Shulkin, under secretary of health for the Department of Veterans Affairs.